Deal, it has to be said, seemed to offer a point of interest for us at every few yards. We started our walk today towards the northern end of the town, and within a few steps came across an information board about the Godwin Sands. 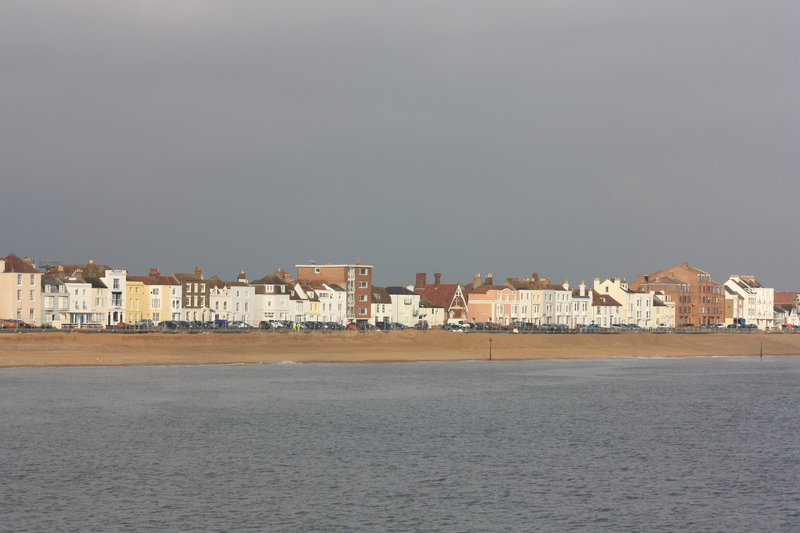 The Godwins are a massive sandbank, lying some 3½ miles off the Deal coast. The sands are constantly shifting, but are approximately 5 miles wide and 12 miles long. At low tide they can stand as much as 13 foot above the waves. At high tide they are submerged, but only just. What appears to be a calm sea of openness in fact hides a solid bank which is only a few inches beneath the surface. It is thought that some 2,000 ships have been wrecked there over the ages. Godwin Sands also have something of a reputation as a summer cricket venue. The first match there was played in 1824. Others followed, not all successful, and several ending in rescue operations. The BBC tried a re-enactment in 2006 and themselves got into a bit of a pickle as the tide came in, losing over £100,000 worth of film equipment. One of the worst recent tragedies concerned the South Godwin Light Vessel. On 26 November 1954 the area was battered by hurricane force winds, and the light vessel’s storm anchors could not hold it in place. At some time between midnight and 1am, she tore free, hit the sands and capsized. The 8 men on board had mustered in the galley, but when the ship capsized the galley door was underwater and the exit sealed. One man, Robert Murton, managed to scramble through a skylight and into the raging storm; the others did not. It was not until daylight when the search and rescue operation found the wreck of the vessel, and a helicopter plucked Murton from the rigging to which he had been clinging all night. He alerted his rescuers to the others trapped in the hull, but the weather closed in again before the lifeboats could approach. The tide then also came in and enveloped the hull. It was after another day of storms before divers could eventually enter the wreckage, on 28 November. Not a single crew member was found and no bodies were ever recovered. The wreckage of the South Godwin Light Vessel can still be seen at low tide today. We did not see the wreck or the Sands. The tide was in. All we saw were the innocent waters hiding their deadly trap. We headed off towards Deal Pier. 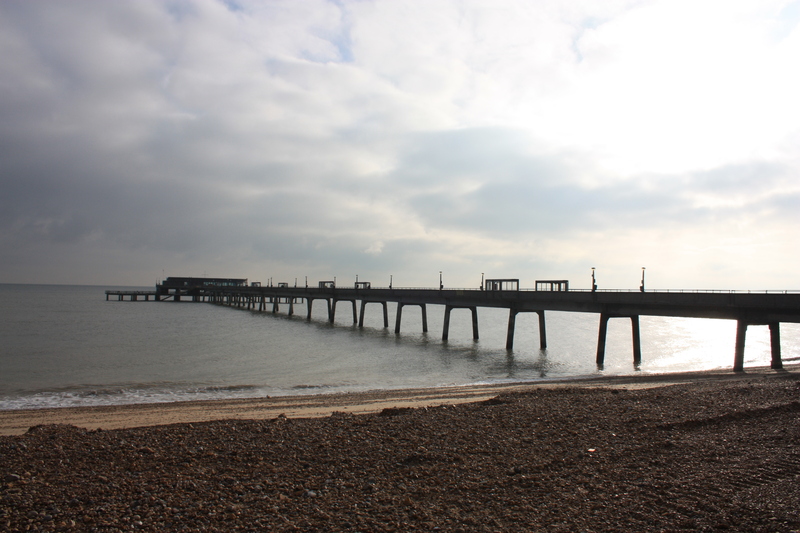 The pier found at Deal today is the town’s third. The first was only half-built in 1838 before it was beset by financial problems and construction was stopped. It suffered from storm damage and sandworm attack, before finally succumbing to the sea in 1857, when it was washed away. The second pier was constructed 1863-4, and stood at 1,100 feet long. In 1940, during the Second World War, the Nora, a Dutch vessel, was hit by a mine and drifted into the pier, destroying some 200 foot of its ironwork. The remainder of the pier was then demolished in order to give better sightlines to the heavy guns defending the coastline. The present pier was constructed 1954-7 and stands at 1,026 feet long. 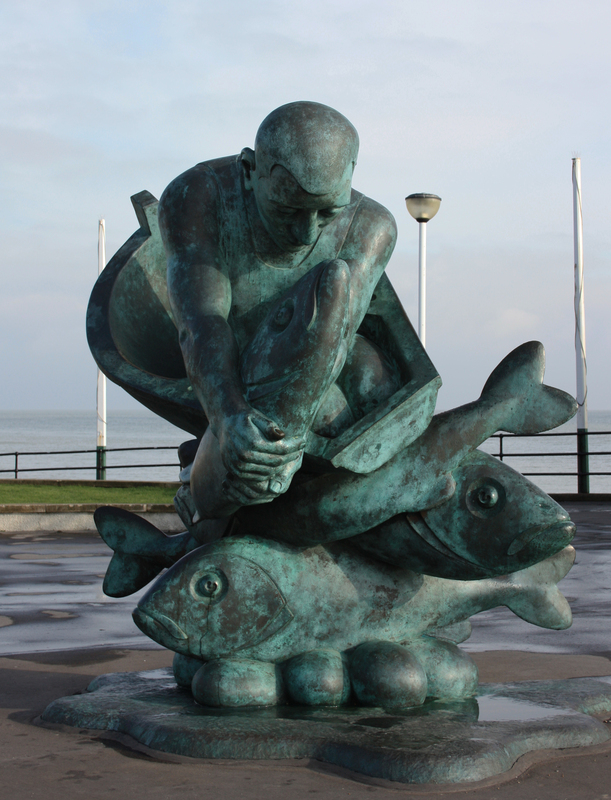 At its entrance is a sculpture, “Embracing the Sea”. If he was intending on catching fish that big, he really should have taken a bigger boat. This giant was not the only one fishing at the pier. 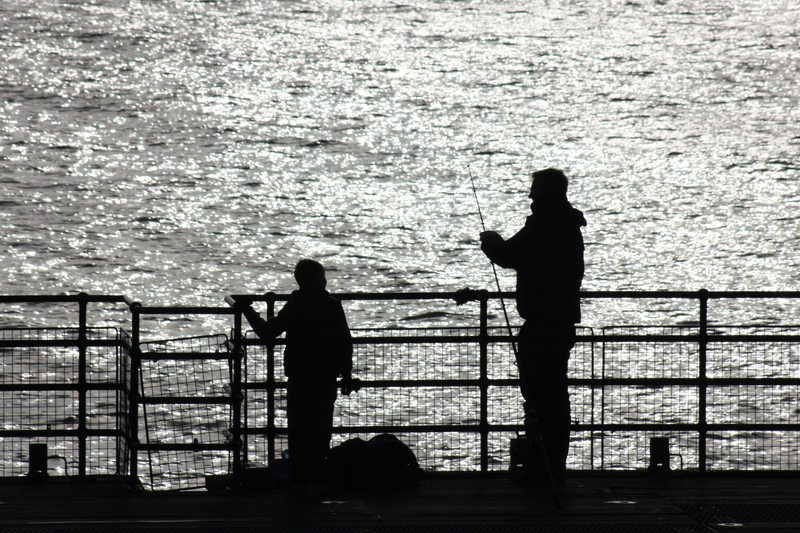 There were fisherman lined at regular intervals all the way up to the pier head. At the end were a father and son, obviously spending a bit of quality time together. From the head of the pier we had a beautiful view north, back to the shore. But that was nothing to the view south, where the cliffs leading to Dover could just be seen in the distance. The buildings almost seemed to be leaning towards them. We were also pulled by the lure of the cliffs. We walked back down the pier and set off. Did I not say that Deal offered us something of interest at every few yards? This post covers half a mile of coast. That means, very approximately, that there is one word of this post written for every step we took in a southerly direction. 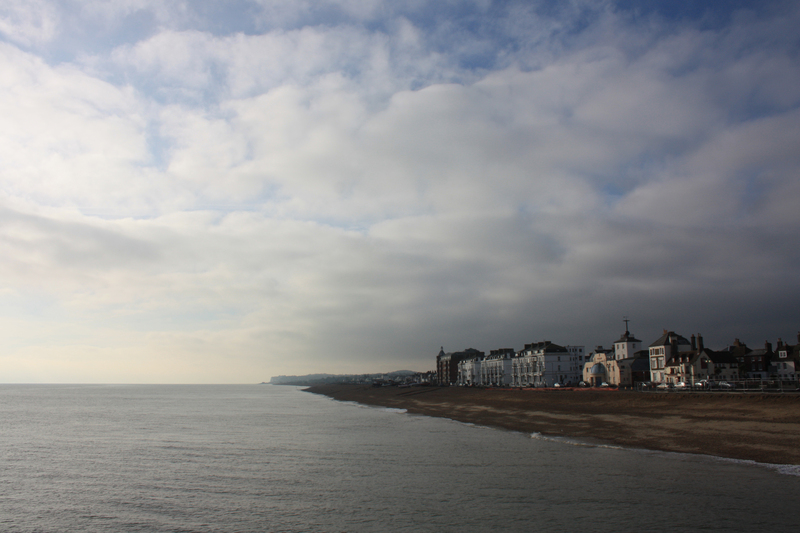 This entry was posted in Kent and tagged coast, deal, Godwin Sands, Kent, pier, sculpture, travel, walking. Bookmark the permalink. Such an interesting and picturesque stretch of coastline. Godwin Sands reminds me very much of our Graveyard of the Pacific (including the Columbia Bar) and Graveyard of the Atlantic (Outer Banks of North Carolina). 2000 shipwrecks. Wow!